UPDATE: This post is outdated. On the forum you can find much better reviews of wallets now, like @NogueiraLuisa's posts about Stellar Desktop Client & Stargazer, Stellarterm & Ecliptic or Centaurus. To see all available wallets visits this page. 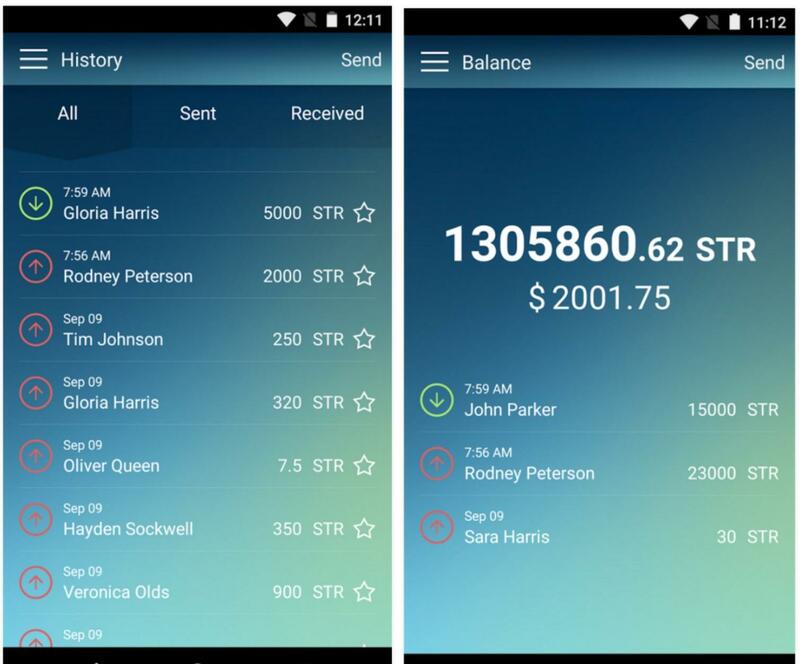 A Stellar wallet is an application that allows you to send and receive different currencies/assets on the Stellar network. 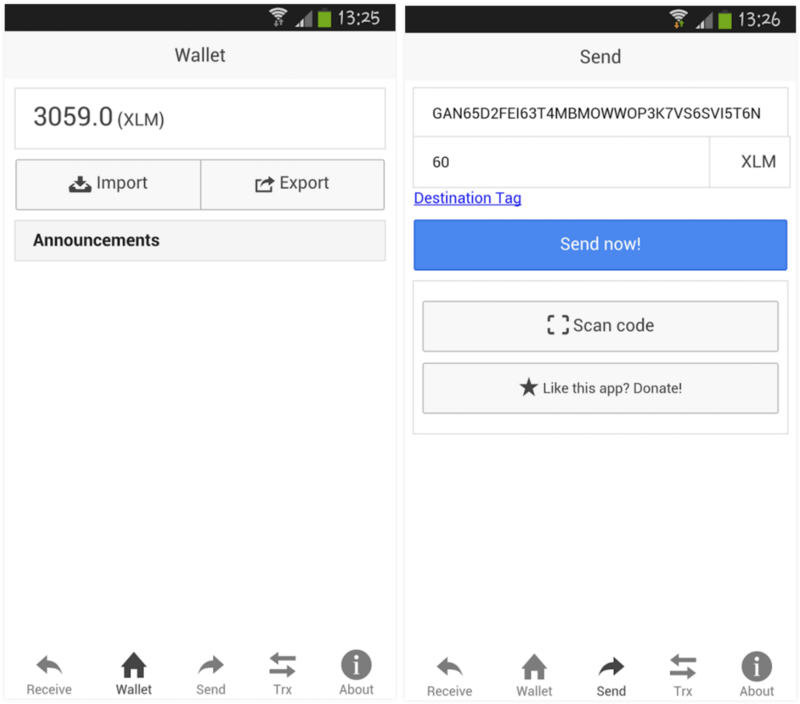 If you come from Bitcoin or another cryptocurrency you may already be familiar with wallets. Usually cryptocurrencies differentiate between wallets that are full nodes or thin clients (SPV). There is no need to have a full node as your wallet. Reason for bundling everything together are mostly historic. The first Bitcoin implementation was a full node, wallet and miner in one. Stellar started from scratch and used a much better separation of concerns. All Stellar wallets are lightweight applications and don't need to download the full ledger history. It will automatically create an account for you and keep the secret key stored in your phone. You should export the secret key and store it in a secure location in case you lose access to your phone. Don't hold more Lumens in this app than you need for every day purpose and you can afford to lose in worst case! Use at own Risk. I had it previously installed on my phone, but didn't use it. After I sent some Lumens to the wallet the transaction didn't show up in the view, but the account balance showed that the Lumens arrived. Then I tried to send some Lumens but it asked for a password that I couldn't remember. I went to their website and reset the password. And I lost access to all the Lumens I had inside. It looks like it removed the secret key from the wallet when I reset the password. This was not clear during the whole process and looks like a really dangerous behaviour from the wallet. It still lets me receive Lumens, even the wallet doesn't have the secret key and I will not be able to get the Lumens out. Something like this should not be allowed. The interface should clearly state that the wallet is not holding anymore the secret key and not only prompt you to enter one when you decide to send Lumens away. I would not recommend anyone to use it for serious amounts of Lumens. Hey! I'm in a situation where I did not save the secret key because Lobstr never indicated it was critical, but saved the 10 recovery phrase. How do I go about getting my secret key to my wallet? I used the recovery phrase and it seems to only reset my password of the account, has nothing to do with the wallet. Per Gleb, he indicated there's a way to recover your secret key using the recovery phrases, but as of now Lobstr.co doesn't have that functionality. Thank you for any insights you have. Cold is my weekend project. Helpful for generating cold wallet transactions offline. How do you mean offline? Can you please describe? Very nice. 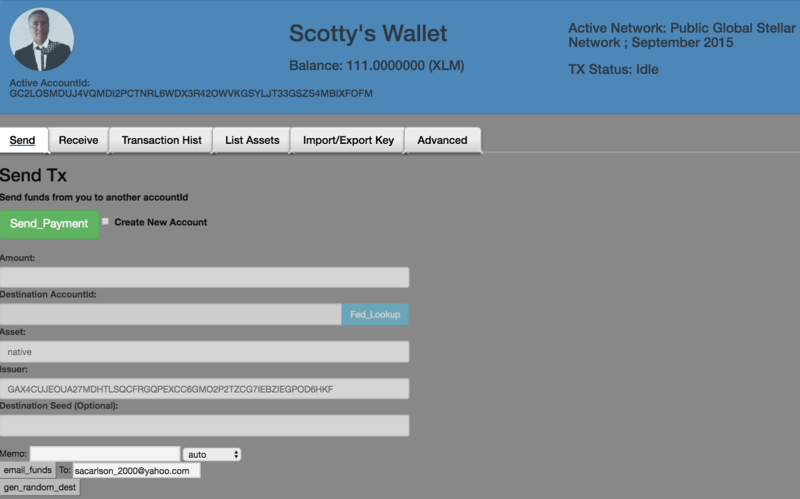 I wasnt't aware of Scotty's wallet. First of all, I'm terribly sorry to hear about your troubles while using our wallet. Our team is looking into the issue which you've described in your review of the stellar wallets, and we will definitely take some actions to notify users more clearly about the consequences of resetting password and actions needed to ensure safety more clearly. We don't have access to your secret key - it is securely stored inside our platform encrypted. Your password is taking part in the process of encryption/decryption of your secret key. We've implemented the logic that allow users to restore their secret keys in case of password loss, using a special passphrase, which is called "Recovery Code". During the registration process, the system shows a message, asking to securely store the recovery code on your side, as it can be used to restore access to your secret key in case of lost password. pitsevich Hello. Recently I started an account with Lobstr.co and joins him. But now the problem is when to send their lumens to another account. How to send lumens of Lobstr wallet to another account ?? Hey there, I am a new user of Lobstr.co but can not create an account. It has been for days that i tried. I always get the error that there are technical problems when i want to create a new wallet. I can login but not create a wallet. Any ideas? Really just server problems and i should wait or did i do something wrong? Thanks in advance. SeanLee Hey Sean, how are your efforts recovering your Lobstr account going? If the funds are still on the wallet linked to that account, you should be able to recover your account using the passphrase and see your secret key! pitsevich Hi Gleb, I'm a noobi and set up my Lobstr wallet a week or so ago. Sent stellar across no problem. Now I can't access my wallet, I've updated the password three times as well as entering the Recovery code, no luck. Sent off message to the support email, which was pure guess work because it's not on the website, I did receive a ticket number which is a start. Any chance you could look into a solution for me please. I updated the text to point to your response. Maybe just make the message more explicit that without the Recovery Code you will loose access to the account after the password reset. I just created a new account and the prompt to save the recovery code is well written and clear. The problem is when you can't log in to your account, you may do the password reset in a hurry and not pay attention or remember that you actually saved a recovery code when opening the account few months ago. I think I printed the recovery code out now that you mention it. I will check my papers when I get home. Lobstr looks really nice, I like the design. I also noticed that the last 2-3 transactions don't show up in my history. Is this related to not having a secret key anymore attached to the account? I can't recover my Stellar wallet's username and password by my email and recovery code. What should I do? stellaruser What wallet are you using? Do you get any error message? Where does the recovery process fail? chainhead sure. You can create and sign a transaction on the offline machine (it also works on Raspberry Pi with no hardware network interface) and then transfer the transaction blob to online machine to submit it to the network. bartek ah ok, got it! Thanks! GOzD Sending Lumens with lobstr should be straightforward. There should be a menu entry with send. What issues exactly do you have? I put an address to send and the amount, as required by the instructions, but is not sending. And the total amount in the purse remains the same. There you can enter any address to send? 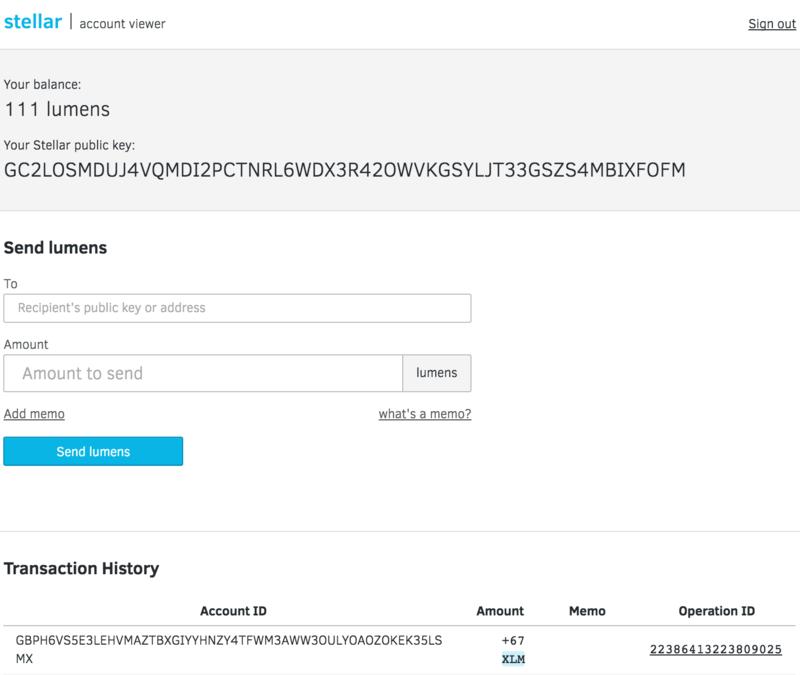 I introduced to send the address to Poloniex is a few numbers, but there is no result, it does not send any where. In this case GCG... is the address. But all deposits have the same address and you need to enter the memo.id to differentiate yourself from other people depositing (it is written where I put the blue rectangle). Send everything there and then send everything from there with the right memo type (memo.id) to Poloniex. Thank you. You're right, I have not looked at the address and enter only memo.id, I did not study it carefully. Soon I will have more time, what would understand. bkolobara thanks. Will definitely try it out. Just wanted to give lobstr a shot and sadly it has this problem that i can login but not setup a wallet. Will report on my steps. Thanks.